11 days into Vegan MoFo and I’ve yet to feature a soup. Shocking! 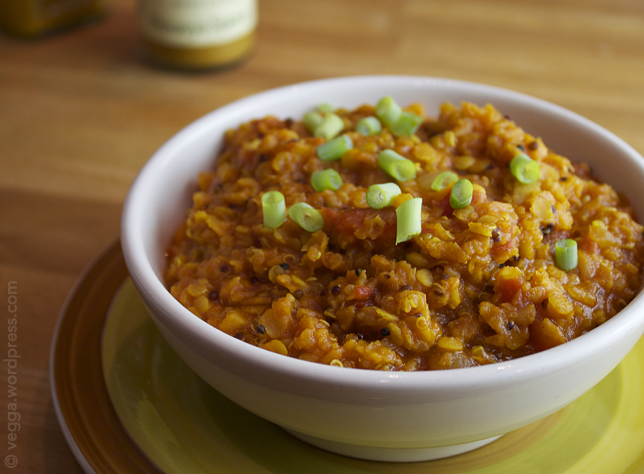 That oversight gets remedied today with a hearty tomato-y red lentil soup that couldn’t be easier to throw together. This ain’t your typical red lentil soup, though—the addition of quinoa not only boosts the nutritional profile, but adds a textural counterpoint to the softer lentils. This soup is versatile, too. Yellow potatoes could easily stand in for the sweet potatoes, and diced carrots would make a fine addition. If you don’t have quinoa, I suppoooose you could leave it out. And if you prefer a creamier, richer soup, just add some full-fat coconut milk towards the end of cooking. That kiss of lemon juice added at the end is non-negotiable, though. Trust me, you’ll want to keep it. In a large stockpot, heat the coconut oil over medium heat and sauté the garlic for 30 seconds or so. Add onion and ginger and sauté for another 5 minutes or until the onion is translucent. Add spices and sweet potatoes and stir until the sweet potatoes are well-coated. Add the diced tomatoes, tomato sauce, red lentils, quinoa, and two cups of the water and bring to a boil. Turn heat to low and let simmer for 25-30 minutes, or until the sweet potatoes are fully cooked and the lentils are soft. Check every 10 minutes and add extra water in half cupfuls if necessary. When the sweet potatoes and lentils are fully cooked, turn off the heat add salt and pepper as desired. Stir in most of the lemon juice, reserving some for serving. Ladle into soup bowls and garnish with the leftover lemon juice, freshly ground pepper, and diced scallions or chopped cilantro. 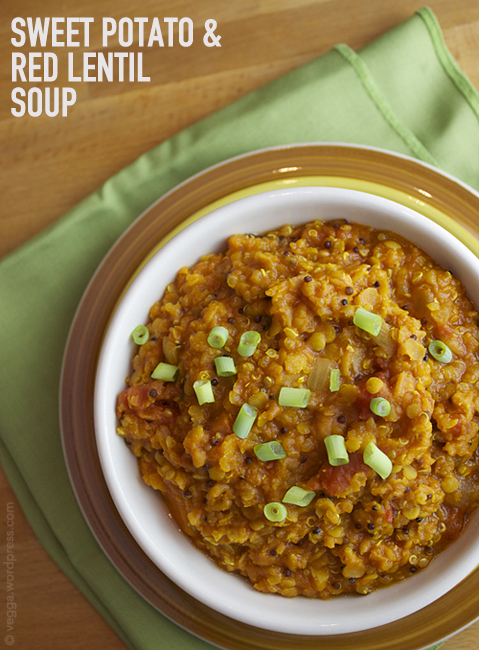 Red lentils boast an impressive nutritional makeup, and this soup adds a few other key ingredients to nourish you. One serving offers 24% of your daily value of iron and 17 grams of protein… but you might not want to have just one serving. What’s your go-to soup recipe? Yes, it’s definitely more of a stew!